Motive CEO honored for scaling growth through investments in programmatic technology. I would not be receiving this achievement without the entire Motive team’s grit and determination to build the technology we are launching. Brendan Smith, CEO and Founder of Motive Interactive, has been announced as one of the winners in the prestigious CEO World Awards® in the CEO Achievement of the Year category. 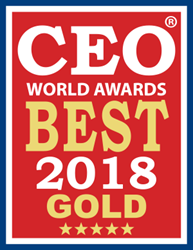 The coveted annual CEO World Awards program encompasses the world’s best in leadership, innovation, organizational performance, new products and services, CEO excellence studies, corporate social responsibility, and milestones from every major industry in the world. More than 80 judges from a broad spectrum of industry voices from around the world participated and their average scores determined the 2018 award winners. Winners will be honored in San Francisco on Monday, July 30, 2018 during the annual SVUS Red Carpet Awards Ceremony Dinner. This award recognizes Smith’s commitment to creative innovation through recent investments in programmatic technology to advance Motive as a leader in the mobile marketing industry. He has directly managed the build out of Motive’s real-time bidding platform, which leverages predictive modeling and machine learning to ensure the most efficient spend of advertisers’ budgets to drive ROI-positive campaigns. “I would not be receiving this achievement without the entire Motive team’s grit and determination to build the technology we are launching. It’s been an exciting year of growth at Motive and there is much to look forward to as we continue to commit to innovation,” said Smith. Motive Interactive is a global mobile app marketing company that combines over 15 years of experience in the digital marketing industry and sophisticated programmatic technology to drive user acquisition for some of the world’s top mobile app companies. In 2017, Motive was recognized as part of Inc. 5000’s exclusive Hall of Fame list for its five-year consecutive rating as one of the fastest-growing private firms in America. Motive has been named a Top Partner by industry rankings for the top-performing mobile media sources, including Singular’s Mobile ROI and AppsFlyer’s Performance Indexes. For more information about Motive, visit http://www.motiveinteractive.com.